Disappearing School Libraries – Why? Libraries/librarians are essential for developing a reading culture in schools. Reading is fundamental to academic success. So why do architects and school leaders see them as redundant spaces? It’s an interesting and timely question. Terry is writing about Australia but it struck a chord with my research on a school in the north of England where early in the planning process a decision was made to “swap” the space a library would have had and share it out to other, more official “learning spaces” in the building. Wifi and a decent internet connection were deemed capable of the information provision function of a library. A strange case and as I don’t research libraries per se, I don’t know if it is anything but an odd example. Nonetheless, that combined with the experience from time supervising the school library when I taught in London, my curiosity piqued by Emma’s recent post on the changes to reading space as schools come under assessment pressures and the Terry’s question itself, I thought I’d have a go at providing some tentative responses. So, why might libraries be seen as redundant spaces? My first thought is whether they are seen as redundant in all types of school. At least in England, the bigger private schools often get new or extended fancy libraries, often by well-known architects. They’re a selling point to the educational/investment value of schooling and they advertise culture, grandeur etc quite effectively. Here’s one recent example at the Tonbridge School. 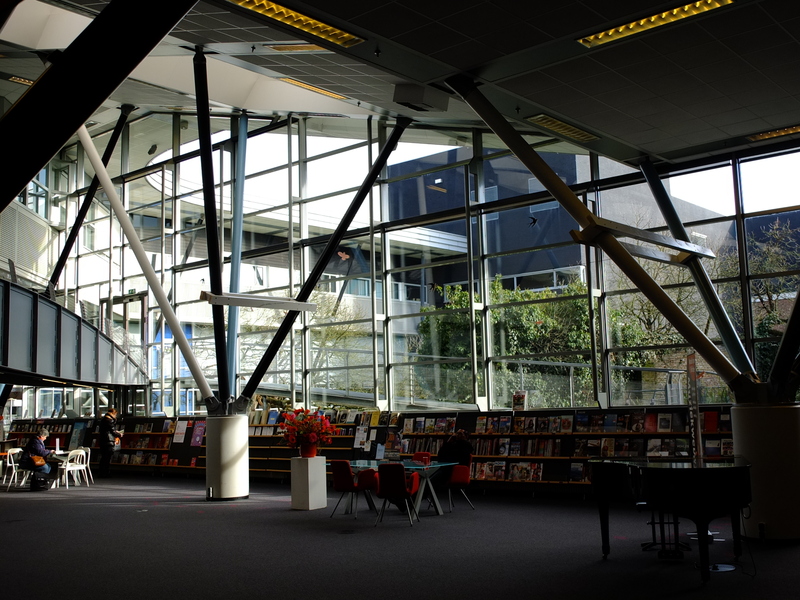 Is the redundancy of libraries a greater problem for state-funded schools (i.e. the vast majority) then? If so, why? A second thought is whether this is a library-specific problem. Are other spaces in schools disappearing? If so, what do they have in common? Again in England and again in publicly-funded schools, there seems (anecdotally at least) to be a problem with disappearing staffrooms: see this article on the Death of the School Staffroom in the Guardian, for example. This too happened in the school I researched with teachers encouraged (by the lack of whole-staff areas) to spend more time in their departments with facilities such as sinks and hot water located there and toilets that staff shared with students etc. Is part of the redundant libraries issue a bigger problem with teaching spaces winning ground (quite literally) from more social, perhaps less official learning spaces then? My guess is yes. In this logic, it’s not just that space is redundant but that if that space can’t be directly and demonstrably linked to pre-established assessment-oriented learning activities it is now seen as an opportunity cost – get rid of it, use the space elsewhere. The moral injunction that schools do all they can to improve learning when learning is tied to increasingly narrow definitional pressures and measures, and teachers’ and principals’ own careers being pegged to the visibility of student progression puts pressure on how physical space is seen. It changes what kinds of space are efficient in this logic. As Lyotard put it, “be operational (that is, commensurable) or disappear” (1984:xxiv also online here). If your library or staff space cannot be shown to contribute to the performance of the system and so its efficiency or value (within the terms of the system) remains an unknown, it loses out. This is the “terror” of which Lyotard writes. To be unvalued is to be anyway devalued. To be value-able means changing what you are. But there’s another way (albeit related) to think of this. The school library space I have in mind is not the hushed, frustrated site of silent, individual absorption but one that lies outside the standard rules of operation of the school: it allows talk or at least has areas where talk is allowed; it is a space of relative safety where no-one is likely to ask you a question; there is no seating plan – you can choose to sit with friends and friends outside of a particular class you are put in by someone else; the adults there are often not teachers, they may be more informal, they may not know your name; if you like books it is a haven but equally if you just need an alternative space in school; if you want to read or work for your pleasure rather than directly for your grades, you can; if you want to go and get advice you seek and want (rather than being given advice someone else thinks important) you can get it and likewise if you want to find out about something off the academic radar you can too. Libraries offer curiosity, lines opening. They are highly organized but not imposing, constructed of suggestions and teases, promises. In short, libraries belong to a special category of space and social rules and are often inhabited by people sympathetic to your desires. School libraries are other spaces. They do not perform the logic of the rest of the school. School libraries are potentially (and I’d hope ideally) disturbing, gently threatening even, spaces of chance and so unpredictability. They provide room for what (at least in England) is being denied –opportunities for the unforeseeable, chance encounters with people and resources that are unlikely in increasingly narrow curriculums. That is precisely their key value. At the risk of taking this too far, one of the advantages I see in school libraries is their purposeless-ness. That is, their purpose is to be purposeless. They are a refuge from the planned and the knowing what is to be known. They fulfill, I think, an import spatial contribution to what Emile Bojesen calls “passive education”, a way of being “attuned to the accidental imprint, the inspirational moment, the absence of (self) certainty, the getting-carried-away by something outside of ourselves, without recourse to purpose, without the necessity of communicable and assessable reflection, without quantifiable linear progress or development” (2016:2). In these terms, libraries become even more exciting as the rest of school becomes ever more predictable, planned and purposed. And this is the final suggestion I have for why they are being left out of some new school designs – libraries challenge the status quo. They offer space for (and evidence of) the passive and the uncontrolled and how effective that can be in those, very different, terms. As a postscript, I should note that I am not against counting and measuring things in education! Indeed one of the worrying facts about school libraries in the UK is that official numbers of libraries are unavailable (they are not even counted) and there is no statutory requirement for schools to have one. The proxies (budgets, staffing levels) used in this report suggest that library provision is decreasing. It would be interesting to find out about new schools though I have no idea how to do this easily short of contacting individual schools/going through their planning applications. A 3-year campaign began recently in the UK to help produce and share more information about libraries in schools. Schools Week gave a write-up of that here. I wrote a post a few years ago about James C. Scott’s Seeing Like a State and why, even though it is not about education at all, the book offers a really helpful guide to education and schooling. Hi Leon. Yes, you’re right and I agree completely – a stronger line on relating libraries to a broader category of problem, another “expense item to be trimmed” would help to see beyond just libraries or staff rooms (important as they are). The picture only comes into focus when you take a broad view and see this as something bigger. Good point – thank you! The false “exchange rate” between books and internet is also interesting, it’s just my interest is in how we are encouraged to transform space into direct usefulness, so libraries lose their social, less predictable aspects. Hard if you want to defend libraries, what do you do? Get into the game and confirm it? Stand outside and risk speaking a different language that no-one recognises anymore? Ah, it’s an interesting, tricky problem!